This seems to be the time of year where everyone is talking pumpkin. Starbucks and other coffee shops start pouring pumpkin spice lattes and pumpkin pie, pumpkin bars (low fat recipe here), pumpkin blizzards are everywhere. I thought I would jump on the pumpkin bandwagon. Last winter I found this scone recipe on the King Arthur Flour website. I was searching for a way to use some candied ginger I picked up at the store. By the way, if you’re suffering from nausea candied ginger is a great thing to snack on to help ease that queasy feeling. 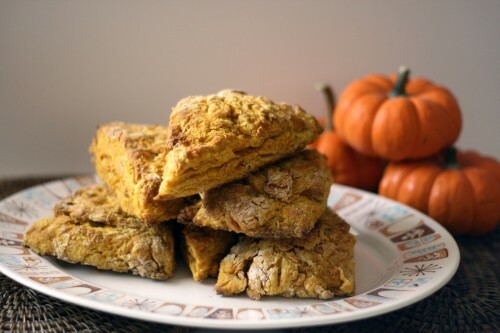 The candied ginger is a slightly sweet and spicy addition to these pumpkiny scones. My favorite part is when a piece of the ginger is on the outside of the scone and it almost becomes caramelized. Mmmm. I doubled the curry powder and added some dried ground ginger to the recipe. I like the spice. The original recipe is very mild so don’t be afraid of the word “curried”. These are perfect with your morning cup of coffee or your afternoon cup of tea. Trust me I’ve tried them both ways! If you’re really in the pumpkin mood serve these for Thanksgiving breakfast. In a medium-sized mixing bowl, whisk together the flour, baking powder, baking soda, salt, ginger, curry, turmeric and sugar. Cut in the butter with a pastry blender, your fingers, or with an electric mixer, until the mixture resembles coarse crumbs. In a separate bowl, whisk together the pumpkin or squash and buttermilk, yogurt or sour cream till smooth. Add this to the dry ingredients, stirring till just combined. Turn the dough out onto a lightly floured work surface, and shaped into about a 10-inch circle and sliced into 8 wedges. Transfer them to a parchment-lined or lightly greased baking sheet, leaving about an inch between scones. Bake the scones in a preheated 425°F oven for 20 minutes, or until they're golden brown. Remove them from the oven, and serve them warm, or at room temperature.